A tooth has three layers enamel, dentin and pulp. When the cavity is so deep that it has reached the pulp, Root Canal Treatment has to be done. In this all the infection from within the tooth is removed, all the canals in the root are cleaned and medicament is placed. The tooth is sealed so that no infection seeps in after Root Canal Treatment. After performing Root Canal Treatment, the tooth becomes weak and brittle. That’s why post Root Canal Treatment crown is very important to protect the tooth. 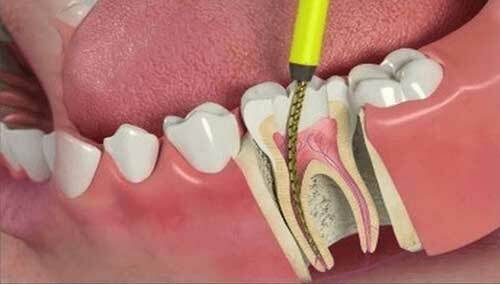 WHY DOES ONE NEED TO UNDERGO ROOT CANAL TREATMENT? The most common symptom that one might need Root Canal Treatment is a toothache. The pain can range from mild to severe. With time it may worsen, and you will feel the pain even when you bite your food. The other reason is prolonged sensitivity. If you feel sensations in your tooth while consuming something hot or cold, then there is the slightest chance that one needs to undergo Root Canal Treatment. Swelling in the gums can also be a sign that you need Root Canal Treatment. WHAT ARE THE CONSEQUENCES OF NOT GETTING A ROOT CANAL TREATMENT? If the pain you feel goes away, then it does not mean that your tooth had healed with time but this indicates that the nerves inside the tooth are all dead and the infection has grown manifolds. The bacteria from infection can enter into the tissues of gum and jaw which can cause a pus-filled abscess. This can even lead to a serious condition like heart disease and stroke. The very first step involves an X-ray which is taken to determine the extent and approach to infection. If required local anesthesia is administered before starting the treatment. The next step is Cavity Preparation. A cavity is prepared, making sure all the infected tooth material or previous filling material is removed and a proper approach to inner-part of the tooth (pulp) is established. This is followed by disinfection and shaping of pulp canals. The infected pulp is cleared out completely, canals are shaped and cleaned. Thorough disinfection is achieved. Clean and disinfected canals are then sealed and filled with an inert rubber-like filling material known as Gutta-Percha. The very last step is restoration & crown. The crown portion of the tooth cavity is then restored with a filling, followed by a Cap/Crown cementation. Do not put pressure on the tooth. Since there is no crown, the tooth is unprotected as a result, putting pressure can cause damage to the tooth. Q.1. Can An Infected Tooth Heal Itself? Even if one does not feel pain the infected tooth will not heal itself and require a proper RCT. Q.2. Do Root Canals Procedures Hurt A Lot? Because the tooth is infected one feels constant pain it is assumed that the treatment will also hurt. But in reality, the treatment is pain-free. Q.3. How Long Does It Take To Heal? A successful RCT can result in pain for a few days but this pain is temporary and will go away with time. One just need to follow good oral care practice. Q.4. Can One Get RCT Done In A Day? Anterior or front teeth have one canal and the back teeth have multiple canals, therefore, the procedure might take 1-3 visits depending upon the difficulty.